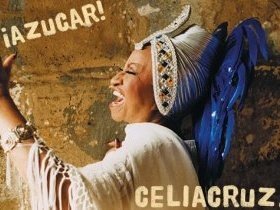 On “Azúcar” (her most famous phrase): “It started when we were dinning with friends in a restaurant and the waiter asked if I wanted coffee with or without sugar … and I answered: “azúuuuucar”, because it was obvious I couldn’t drink Cuban coffee without it. That night during the show, I told the story and the audience died laughing. Later, the public started requesting that I tell them the story about the sugar… Until I grew tired of it, and before they asked I came out screaming: “Azúcar” … I never told the story again, but kept repeating the word.